15% bonus to exp? Really? Because your pvp servers are all doing so well(sarcasm). When will you get that prioritizing pvp is a BAD idea? Progressives will be boycotting your office with signs accusing you of corrupting the youth with violence. I'm not a progressive btw so it won't be me but constantly pushing pvp is just not a good idea. There is a niche for it there always has been but not all of us are into esports. Not to mention in this day and age Us vs Them has gotten to insane levels. I miss the comradery of the old game and helpful people and you can't find it on either side anymore. I get enough real world violence, mayhem and just plain ugliness everyday on tradechat, FB and Twitter. I deliberately did not go for the falcosaur mounts because of the pvp aspect which I've done in the past but I'm just plain tired of it now. At least make it able to toggle from a rested area, like Dalaran or the class halls/inns. Having to go all the way to SW just because I want to turn it on/off? A bit of a pain. Also, I am phased from people not in war mode. So I can't quest or something with non-war mode friends or help each other with anything PVE unless I go, again, all the way to SW just to turn it off. I've no problems with warmode, I'll have it on 100% outdoors, the only problem is juggling between pvp and pve, since you tailored your talents for warmode, when a dungeon queue pops, you lose your pvp talents that compliment the rest, but now you feel like your hands are tied without them in a dungeon and you need to use 2 tomes for every dungeon to have fun. Sure you can have 2 specs 1 for pve and 1 for pvp and just switch specs outdoors without burning 2 tomes, but it's just a bit punishing for people who love a particular spec. I guess nothing is perfect and this is the best we can have. Edit: Yes. Yes you do. So, we can only turn War Mode off in Stormwind, but we're already seeing groups camping the teleports in Argus. A pile of Hordies gank you, but you can't resurrect without getting ganked again, and you can't even hearth to Stormwind to turn it off. A bit frustrating. It seems that the old camp-and-grief tactic is going to be a thing again. PROS: Everything except one thing. CONS: 110's can destroy little folks whom are trying to level. LOVE IT! Esp. the bonuses :). +10% experience boost while leveling. +10% World Quest reward bonuses at max level. It's a carrot on the stick to goad people into pvp. So if you want to get to a goal of raiding, leveling, etc.. as quick as possible, you're forced to pvp. People don't like being forced to do things. Sure it's at least more interactive to say the mission tables. I've played on pvp and pve servers. My uninterrupted play time has greatly diminished and thus only goal is to level to cap and do normal raids or LFR (it's a face roll but there doesn't tend to be enough time for me to look for a group, considering there's no time i can stick to for a scheduled raid... I know.. it's my problem, why change the game for me. Its' my opinion that pvp is lazy, from the development side of things. Not saying it's easy to implement or anything like that. I'm saying it's easier than being creative (more quests, more content).. and to force it upon people that liked the equation WoW followed since creation with boosts seems entirely unfair. Sure if I don't like it I wont do it, right... that'll work (never works). Blizzard already has pvp games. Stop pushing it on WoW as a whole. I'd like to see those 2 bonuses vanish OR keep them in... as a 3-5hr reward for getting a bounty on your head.. that way you can go back to <main city> and turn it off, if you want. It should be a reward, not a feature for adding more people into the pvp pool. Lets see the numbers pvp'ing with those 2 boosts off, if numbers don't change drastically after 2 weeks.. (ratios not numbers) add it back in. For anyone else trying to get Exalted with Legion Allied races, after a quick test, it looks like Warmode does not increase rep rewards/gains from Legion World Quests. Is warmode xp boost aplicable to the xp you get in low lvl dungeons. 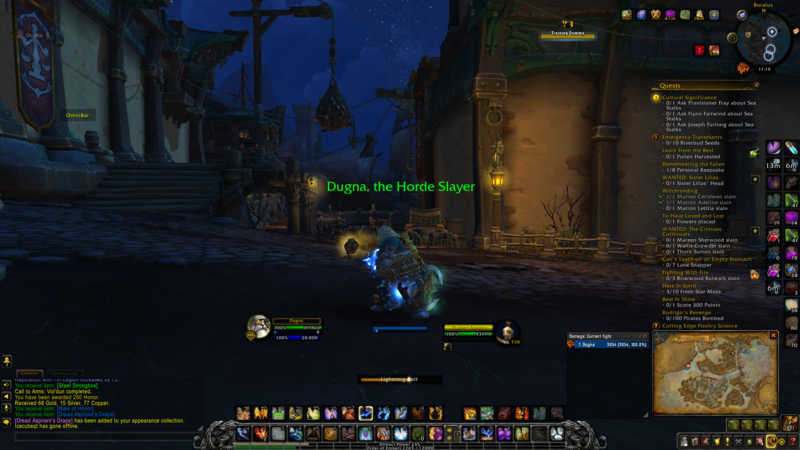 For expample, say im leveling a new character and i'd like to do dungeons to make the experience go faster, will the xp boost from warmode being turned on affect those dungeons? To Toggle/Enable "War Mode" go in to Specialization & Talents, click PvP Talents arrow in the upper right, then click on War Mode at the lower right. You will hear a hit and "For the Alliance". You have to be level 20 to turn on warmode. I could not find this anywhere!